Christmas Day was celebrated by two Okehampton Running Club members by participating in a special Exeter Riverside Parkrun. The was a huge turnout of people keen to put a few miles in before the Christmas indulgence and both ORCs made their mark on the morning run. Jo Page set yet another 5k PB by knocking 26secs off her own record to finish in 20.13, while Claudine Benstead set a new club age category record for FV55 clocking a terrific time of 21.28. On Boxing Day the Beat The Fox run in Fremington attracted another huge crowd of 600 runners to take part in this novel charity race. Starting from the Fox pub in Fremington the runners are led out on the road for a short way by the “Fox” before he stands aside at the start of a muddy track to let all runners pass him. The aim then is to stay ahead of the Fox for the duration of the 5k course. Once again many runners were in fancy dress, not best suited to the muddy tracks, fields and stiles that had to be negotiated. 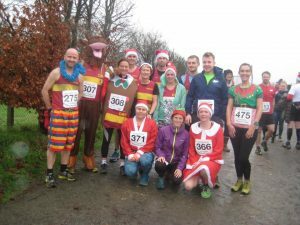 There were six adult Okehampton runners up for this festive jaunt, two of whom had their children, junior club members, running with them. Fastest round the course and never in danger of being caught by the Fox was Jo Page to finish 2nd Lady, while ORCs Ian Page, Jane and Derek Jackson all finished safely without the Fox over-taking them. Gill and Phil Spinney and their children were beaten by the Fox, but young Kiera and Aiden still loved the race, enjoying the chance to run through stretches of muddy water dressed as Cinderella and a Gladiator. Thank you Jane for the reporting. ‘Tis the season to be “Extremely Jolly”. Races at this time of year tend to be about having some fun round a muddy course while wearing some non-too practical fancy dress. This was the case for most of this week’s Okehampton runners taking part in races guaranteed to result in mud covered shoes and waterlogged clothes there were several on offer last weekend, starting with the Extremely Jolly race at Escot House in Ottery St Mary on Saturday. This 7 mile run offered multiple chances to get completely wet at river crossings and copious amounts of mud to run through, but also boasted another opportunity for the runners to get even wetter by shooting down a waterslide over a slippery, wet tarpaulin, with a photographer at the bottom to capture some great action shots. Okehampton had five runners here, all finishing in the top 50 places and led home by Angus Farrelly in 1.08.10, with exactly a minute separating him from super-vet Ian “Daddy” Page in 1.09.10 showing you are never too old to enjoy some festive mud. Jo Page, Karen Vallance and Emma Dean had fun running together and finished in 1.12.40. Sunday saw the Christmas mud and hill ritual of the Torrington Christmas Caper. This mixes a tough competitive off-road race with a great tradition of ridiculous fancy dress and is renowned for its great atmosphere. Starting and finishing at Torrington Rugby Club the course is just under 10 miles of muddy fields, woodland tracks, some road and some stretches of the Tarka Trail. The recent heavy rain ensured that the runners not only waded through knee high water at river crossings, but also at several other places where the water had collected. Okehampton had 17 runners, some serious and some just out to enjoy one of the last races of the year. This year there was an opportunity (for our runners only) to re-fuel on mince pies and chocolates and have a drink of mulled wine at Watergate, the halfway point, provided by fellow ORCs Jane and Derek Jackson. At the sharp end of the race there was no time to stop for Paul Carter who had a great run to come 17th overall and first MV50 in 1.12.02 with club mate Stephen Sincock not far behind and taking 2nd MV50 in 1.13.31. Jo Page was next, who, despite not feeling too well, clocked a great time of 1.17.45 in a full Mrs Santa costume to take the first Senior Lady prize. Most of our other runners were only too glad of a chance to stop for some much needed sustenance, hoping the mulled wine would make the second half seem less painful. 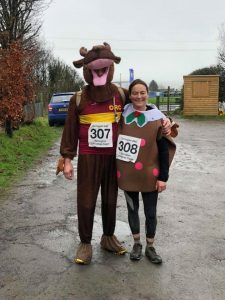 This was particularly the case for Gill and Phil Spinney who had opted to run dressed as a Christmas pudding and a moose! Unfortunately the extremely mild day made it uncomfortably hot to run in a moose suit which also had the disadvantage of weighing considerably more after wading through stretches of water which got trapped in the legs. There was some consolation however in that they won the best fancy dress prize for their efforts. Other ORC times; Alec Robinson; 1.20.42, Hayden Bond; 1.23.40, Mike Baker; 1.24.10, Jean-Paul Quertier; 1.24.39, Jason Ewing; 1.27.22, Kathleen Sincock; 1.35.25, Tom Andrew, Jo Turner, Karen King, Geraldine Walter, Mags Jarvis and Christine Fritsch all ran together finishing in 1.51.49, with Phil and Gill Spinney together in 2.20.26. 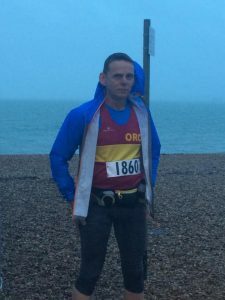 One ORC though had a much more serious task ahead of him on Sunday, when Phil Read took on his first full marathon, running the Portsmouth Coastal Waterside Marathon. Phil joined the club along with his wife Susan through the beginners group a couple of years ago and soon found he most enjoyed the off-road and moor running. He has progressed to become a consistently good runner but has never tackled anything more than a half marathon distance before, so this was a big step up for him. The race started on Southsea Pier and followed the coast out to Hayling Island and back with the terrain a mix of shingle beach, some slippery and muddy paths, as well as some road. While coastal races may be flat, the gamble is with the weather on a site that is exposed to the wind, luckily however, conditions on Sunday were dry and mild with little wind. Phil ran a great race, pacing himself well and feeling strong throughout to finish in a very good time of 4.04.17. While the majority of ORCs chose Torrington for their festive mud race, one member, Liam Keen, took on the alternative mud-fest of Mud Crew’s “The Scrooge”. Held at the Lost Gardens of Heligan this race is billed as 7 miles of muddy trail running and festive fancy dress mayhem but this understates the real nature of the course where, in wet conditions the runners may end up wading through chest-high water or even swimming. Despite not having been running much recently Liam enjoyed himself here finishing in 2.09.45 having clocked 2 miles more than advertised. Last Thursday 22 athletes from the Junior section of Okehampton Running Club competed in an in-club sports day to record times and distances to mark the final training session of the year. The Junior section of the club started in November and this gave the young athletes the opportunity to set Personal Bests in running, shot put, standing long jump and foam javelin. Families were invited to stay and watch with some helping record the children’s achievements. Athletics Coach Rob Hicks has been impressed with the attitude and ability of the children who improved and developed their technique with every session. Feedback from children has been positive with some looking forward to training all week. The athletes will complete the same activities at the end of the Spring Term and it is hoped to see more improvements in their performance. It was an exciting weekend away for five lady ORCs who travelled to Italy to run the Pisa marathon and Half Marathon. Once a maritime power to rival Genoa and Venice, Pisa now draws its fame from an architectural project gone terribly wrong. It has a fast flat course that starts at Miracles Square at the centre of Pisa and finishes next to the Leaning Tower of Pisa, following a beautiful route largely through the Tuscan countryside with the final few kilometres within the walls of the city. Two Orcs, Jackie Dawes and Deborah Cunningham ran the marathon, while Ruth Bushell, Kerry Morashti and Janet White opted for the half. On an uncharacteristically cold day they all ran well with Jackie Dawes having a superb race to come home first for the club in 3.54.29, an incredible 25 minute PB and a new club age category record. Deborah enjoyed this marathon much more than her previous one in the spring, finishing her 10th marathon in 4.52.09. In the Half Marathon all three ladies had good runs with Kerry Morashti finding some of her old form to finish in 2.05.03 to be the first ORC home. Ruth Bushell was just relieved that the achilles tendon problems she’s had didn’t spoil her enjoyment of the race, finishing in 2.30.02 with Janet White not far behind in 2.32.49. Okehampton Running Club’s racing regulars Roger Voaden and Jo Page were in action again this weekend with Jo taking part in the Wellington Monument Road Race. Starting from the Catherine Wheel public house in the village square at Hemyock, the route climbs to, and circles, the Wellington Monument, returning along the same road to finish at the local primary school. At just over 10k it is quite a tough run, with a steep ascent in the first half before an equally steep but scenic return. Despite its title, it is officially multi-terrain as it incorporates about 1.5k of stone tracked bridlepath. Jo had a great run to finish in 44min 10 sec and very pleased to be third Lady. Okehampton runner Angus Farrelly joined over 250 other runners on Saturday in PureTrail’s twilight run, Race The Light. This race is a shadowy 8.5 miles, meandering through Flete Estate’s secret tracks and trails along the Erme estuary. Starting at 3.30pm on the sand, the runners immediately get their feet wet as they cross the estuary on the outward leg. From there they follow muddy paths and tracks on the estate before returning to the estuary for the return crossing and a chance to wash all the mud off. Due to the heavy rain the river was higher than expected, but Angus managed to cross before the light had completely faded, finishing in 1.20.48. 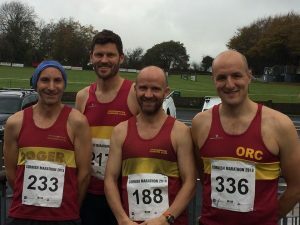 It was a quiet weekend on the racing front for Okehampton Running Club members with just a couple of ORCs finding the incentive to get out and race in grey and windy conditions. Nothing seems to deter Jo Page from having her weekly race and this time she travelled up to Weston Super Mare to run the Weston Christmas Cracker 10k. Now in its 31st year, this is Weston AC’s largest race by far and people come back year after year to take part in the festive run. Such is the popularity of this race that entries sell out as early as September, with runners travelling from far and wide to line up with 2,000 others dressed as Santas, elves, reindeer, snowmen, penguins and angels. The course includes sand, pavement and tarmac with the first four miles being run on the wet packed sand on the beach. Heavy overnight rain, a tide that had just turned before the race start and strong gusty winds made for challenging conditions and this was no easy fun run but a hotly contested, tough race. Dressed as a lady Santa Jo put in her usual great effort and came home in 43.30 to be sixth senior lady and unbelievably still managing to set a 54 second PB! Jane Richardson is another weekly racer, running a Parkrun most weekends when she isn’t competing elsewhere. After moving up a group in her training nights with the club, Jane’s running has been improving and she has knocked seconds off her 5k PB several times. This weekend saw another PB in pretty awful conditions when she completed the Exeter Parkrun in 28.04. The third round of the Westward League X-country races took place on Sunday. Held in Exeter this event included the Devon Championships where runners can qualify to go forward to represent the county later in the year. This always makes for a good turnout at this meeting and on a mild December day there were large fields of runners in all the races. Despite the recent heavy rain the course was in a reasonable condition with just one uphill section being very wet and muddy. The ladies were the first to race and this year Okehampton had an impressive ten runners competing. The brilliant Jo Page was first home for the club again, followed by the the senior Marvin, Sarah, with our newest member, Claudine Benstead ,making an impressive debut for the club, two places behind and just ahead of Molly Marvin. Jo Bradford was next, desperately trying to encourage team mate Karen King who has had a very heavy cold, who finished a little way behind. Jane Jackson again came in just one place ahead of Christine Fritsch followed by Mags Jarvis and Mel Priday. Not all of the ladies had entered the Championships, but those who did had some excellent results with Sarah Marvin and Jane Jackson both getting bronze in their age categories, while our senior ladies team of Jo Page, Sarah and Molly Marvin and Jo Bradford also claimed the team bronze, as did the ladies Vet team of Sarah Marvin, Jo Bradford, Karen King and Jane Jackson. Ladies who didn’t medal were not far off with Jo Page an excellent 8th in the biggest and most hotly contested senior ladies category. Molly Marvin was 5th in the under 20 Women, an improvement of three places from last year and qualifying her for the county Championships. Jo Bradford was 5th FV45, Karen King 4th FV40, and Mags Jarvis 5th FV60. 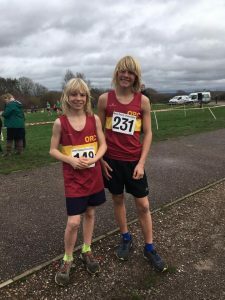 There were two juniors running for the club, Tom and Sam Priday who both ran very well, Sam coming in 4th in his Under 15 category giving him the chance to go forward to run for Devon at County level. The men also fielded a good turnout, running on a course that was considerably more churned up by now. It was good to have Paul Crease back in the team after missing the Newquay fixture, leading them home with an excellent 53rd place to take the silver medal in the MV45 category. Hugh Robinson was next, just out of the medals to be fourth MV40. Paul Carter ran a great race to be the next home but hadn’t entered the Championships and followed by another great run from Stephen Sincock. Graham Bryant held off a fierce challenge on the run in, while Christian Davies and Indigo Ramsey were still overtaking runners in the finishing straight. Jo’s dad, Ian Page made a great comeback after having to pull out at Newquay with a calf injury, to claim bronze in the MV65 category. It was also a comeback for Stuart May, who has been absent from our team for two years, although not quite as fit as he was then, but non the less happy to run again and welcomed by his old team mates. The results from this third round have had no effect on the men’s team standings, but the Ladies Senior Team has moved up from 16th place to 11th and the Ladies Vet Team from 13th to 8th. 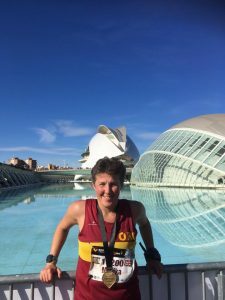 One Okehampton Running Club member, Monika Richards, took a trip to Valencia in Spain to run the Valencia Marathon where the December average temperature of 16 degrees and the entirely flat course make for just the right conditions for a fast PB. This marathon is renowned for the music all along the course and the route is mainly suburban, but does take the runners through the old town and the Turia park, with a scenic stretch along the coast. Monika had only completed one marathon before and was looking to improve on that time. Unfortunately the weather was considerably hotter than usual and she found it hard in the 21 degrees, but determined to fulfil what she had set out to achieve, she pushed on as hard as she could to reap the reward of a sub-4hr finish, coming home in an impressive 3.55.26, an improvement of 6 minutes on her previous one. Rob Cunnington took on the challenge of a night time race over open moorland when he ran the 10 mile Burrator Noir on Saturday evening. Due to landowner issues, the course had to be changed slightly this year, although the overall distance remained the same. This would be quite a tough race in the light and it was Rob’s first try at night running but he enjoyed the experience despite the relentless uphill climb on a rutted track from the start, finishing in 2.15.01. Thanks to Jane for reporting. Last week saw the end of the club’s Couch to 5k beginners course and it was finished off on Sunday with an opportunity for these new runners to put themselves to the test and complete a 5k timed run on the Granite Way. It wasn’t a race, just a chance for them to prove to themselves that they had come a long way from when they started 10 weeks ago. A 5k course was measured out, starting near Prewley with the runners heading towards Okehampton and turning at Meldon Viaduct for the return half. On a cold and grey morning it was good to see twelve of the Pavey group turn out to give themselves the chance to run a continuous 5k and be awarded with a certificate upon completion of their run. Every one of them completed in under 38 minutes with Jim Fitton finishing in under thirty and all were delighted with their efforts and we now look forward to them starting their transition into the club. After these runners had completed their time trial another one was held for other ORC members to run for their club awards. Twelve runners also took part in this with several of them running new personal bests. These were Tom Andrews; 21.24, John Binns; 21.26, Katherine Murray; 24.11, and Paul Evison who not only set a new PB but also a new club record for the MV65 category with a time of 23.16, while one of the new junior members, Mathew Richards, ran his first 5k time trial, completing in a very respectable 20.54. Merv Rice enjoyed a great run when he took part in the Adidas Terrex 10k which is held in conjunction with the Kendal Mountain Festival in Cumbria. Merv attends the festival most years where his son-in-law is the event manager and this year was blessed with beautiful weather to get out for a run on the surrounding fells. The race was started by Olympic Triathlete Jonathan Brownlee and the route took the runners out of town from the centre of Kendal, taking in the Tour of Britain finish climb, before heading off road to Scout Scar. Here they turned right along the escarpment where there were magnificent views across the Lyth Valley, before returning back to Kendal and down steep cobbled streets to the centre. Merv thoroughly enjoyed the chance to run in this beautiful area once again, finishing in 1.01.13. One Lucky ORC found blue skies and sunshine to run in on Sunday. 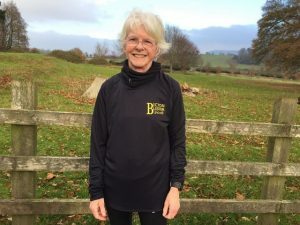 Jane Richardson took part in her third 10 mile race in three weeks when she ran the Bicton Blister in East Budleigh. The race starts and finishes at Bicton College with short road sections, but is mostly on forestry tracks and on the sandy and stony heathland paths of Woodbury Common. Jane had a very good run here, thankfully not adding any extra miles by getting lost as she had at the Drogo10 last week, to finish in 1.52.58. Thank you Jane Jackson for your reporting. Drogo 10, and some Smurfs. The Drogo 10, another very popular local race, was the main focus for our runners last weekend. Set in the grounds of Castle Drogo and the beautiful Fingle Woods that fill the valley below it, this is a tough 10 miler with a some steep climbs, most memorably the brutal Hunters Path climb with nearly 450ft of ascent between miles 8 and 9. At this time of year the compensation for this effort are the the wonderful autumn colours, made more enjoyable by the sunshine and good conditions underfoot, making it a perfect day for running. The course had been slightly adjusted this year, extending it slightly to make it the full ten miles of its title. Thirteen Okehampton runners took part, the first home for the club being Alec Robinson, finishing in 1.23.04, while the first ORC ladies were Jo Page and Karen Vallance, coming home together in 1.36.45. Other ORC times; Mike Baker; 1.26.12, Angus Farrelly; 1.43.31, Paul Evison; !.46.51, Robert Cunnington; 1.49.03, Christine Fritsch, 1.49.40, Mags Jarvis; 1.51.17, Janet White; 2.12.34, Ali Holiday; @.12.34, Danielle Fullford Brown; 2.19.01. Jane Richardson finished her “Drogo 11” in 2.20.39, having added an extra mile after unfortunately taking a wrong path along with a group of other runners. 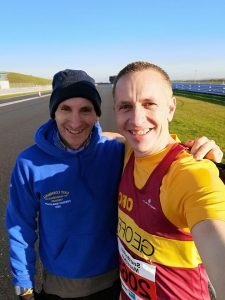 There was a long journey to Bury St Edmunds in Norfolk on Sunday for marathon buddies Roger Voaden and Geoff Hill to take part in the Snetterton Race Track Marathon. The course is made up of six laps of the iconic race circuit, making for a flat, smooth and fast run but being very exposed to the cold easterly wind that was blowing this weekend. Lapped courses are never as easy to run as they sound but Roger has the experience to handle any marathon and came home to 3.27.13 to be 16th overall. Geoff tackles every marathon now with the promise that this will be his last, finishing here in 3.50.26 and vowing this will be his last EVER….watch this space! Saturday provided a warm up to Sunday’s race for Jo Page when she took part in MoRunning’s Mo 10k in Exeter. This event, held on the Riverside Valley Park supports the Movember Foundation, a charity tackling men’s health, but the race is lighthearted with fancy dress encouraged and most runners sporting moustaches of various types. Jo ran with a friend and they finished in 53.20 to become proud owners of a moustache shaped medal. On another lighthearted note, but with an equally important reason, several ORCs took part in Friday’s Children In Need fundraising by “running” a five-legged race through Okehampton. More of a glorified pub crawl whilst tied to several friends than a race, hats off (or maybe wigs off) to Jo Burrow, Viki Hayer, Lucy Brint, Jo Bradford, Geraldine Walter, Hannah Woods, Tracey Mills and Beki Simmons who risked life and limbs to run approximately a mile in around 45mins, hopefully their slowest mile ever! 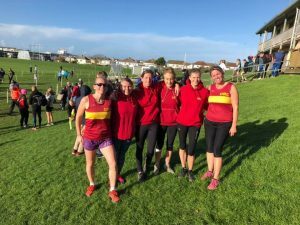 After a sombre morning of reflection on Remembrance Sunday, athletes gathered at the second event in this year’s Westward League X-Country held in Newquay, incorporating the Cornish County Championships. 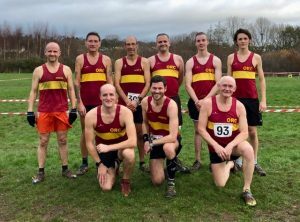 Okehampton had struggled a bit to fill teams due to injury and other commitments but managed to field a Senior and Vet team in the ladies and a senior team in the men’s race, with some juniors also representing the club. Despite the previous day’s rain the conditions underfoot were remarkably dry and the races took place in beautiful sunshine, but with a strong and very cold wind. Having his first Westward League outing, young Tom Priday was the first to run in the Under 13 boys coming home strongly to overtake several runners in the finishing straight. The Ladies were next, missing League stalwarts Sarah and Molly Marvin this time, but Jo Page secured a some good points for the club with another very strong run, while Jo Bradford and Karen King came home together, their places counting for both Senior and Vet Teams. Next was Jane Jackson, finishing one place ahead of Christine Fritsch who she’d overtaken on the final hill, but not managing to overhaul the next runner. Next in was Mel Priday who, with two sons running, had decided to don her ORC vest and have her first run in the Ladies team here. The two Under 15 boys were next up with Sam Priday having another great run to finish eighth in a field of top class runners and Harrison King keeping going well after racing three times in the previous four days. In the Men’s race Hugh Robinson seemed to have recovered well from his Cornish Marathon the weekend before to come in first for the club, his time being over a minute faster than his run here last year. Westward League rookie Hayden Bond ran a very impressive race, keeping Hugh in his sights all the way round to finish just three places behind him. Stephen Sincock was next to gain some good vet points with two more runners separating him from Graham Bryant. Christian Davies was not only taking part in his first Westward League race, but also only his second race ever and had a very good run to come home next ahead of Stuart Page. Unfortunately Ian Page pulled a calf muscle on the second lap and had to pull up, very disappointing as he had won his age category at the Plymouth meeting. On Saturday evening a large ORC contingent took part in the Exeter Glow in the Park, a fun event held at Westpoint. Described as the ultimate night time neon event for families and friends, this 5k run has a course of 2 laps on paths. tracks and some grass, the way being marked by flashing arrows. Competitors could walk, jog, run or even dance their way round, passing through “glow zones” on the way with the money raised from this going to two Downes Syndrome charities. 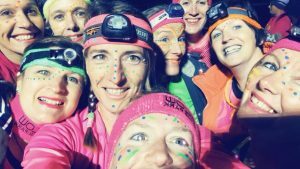 A great time was had by all ORCs and their families who took part, all entering the spirit of the evening with fluorescent face paint and colourful hi-viz clothing. After an original forecast for wind and rain on Sunday, there were actually near perfect conditions for the Bideford 10 miler where Okehampton Running Club was once again well represented with 23 runners taking part. This very popular race has a fast and flat course that starts on Bideford Quay and follows the road out to Yelland before returning along the Tarka Trail. With the good conditions and a fast course the ORCs managed to amass no less than 12 personal best times, two club records and three age category places in a very competitive race. First home for the club was Hayden Bond, determined to complete in around 65mins, but exceeding this target to come home in 1:04:01 to set a huge PB. Stephen Sincock was next home for Okehampton with a very impressive run, his time of 1.05.23 securing him 1st MV55 and setting a new age category club record, with Andrew Vernon coming home next in 1.07.49to be 3rd MV50. 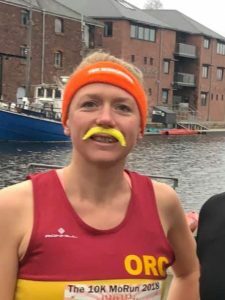 Next to finish was also the first ORC lady runner, Jo Page, her third race in eight days not seeming to affect her performance and finishing in an incredible 1.09.03 to set a new overall Ladies club record in her first race over this distance. Vet runner Jane Richardson was the only lady ORC to get an age category place, coming 3rd FV65 in 1.37.19, amazingly still setting new PB’s at an age when most are getting slower. Other ORC times; Geoff Hill; 1.11.08, George Haskell; 1.11.36, Tom Andrew; 1.18.50 PB, Philip Read; 1.18.48 PB, Jackie Dawes; 1.21.07 PB, Karen King; 1.22.03 PB, Mike Westland; 1.25.57, Paul Evison; 1.25.35 PB, Jane Jackson; 1.26.52, Chris Fullford Brown; 1.27.43, Geraldine Walter; 1.28.26 PB, Christine Fritsch; 1.29.26 PB, Mags Jarvis; 1.30.56 PB, Paul Jelley; 1.33.59, Jo Burrow; 1.35.08, PB, Rachel Haydon; 1.38.33, Lotte Smith; 1.40.07, Vicky Hall; 1.42.01. Four ORCs had a successful outing to the Cornish Marathon on Sunday. With over 2,000 feet of ascent and a steep climb from miles 24 to 25, this is a tough marathon but still a very popular one for runners who really like to test themselves. Hugh Robinson was the first home for the club in 3.14.06, an excellent time for such a hilly race and one that earned him a top 10 place and a win in the MV40 category. Paul Carter always runs well here and he didn’t disappoint again with a time of 3.19.19 to come 15th overall. Roger Voaden finished in 3.24.30 and Graham Bryant in 3.36.50, the collective times for all four (and after a recount) giving them the 3rd 2nd Male Team prize. 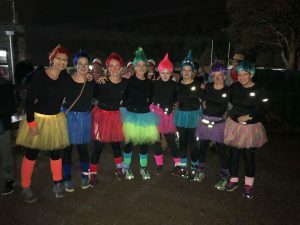 On Halloween Jo Page took part in a night race organised by Jolly Running. The Dark Halloween 10k Trail race started from the Drum inn, Cockington and took the runners on a hilly route through Cockington and Scasdon Woods with terrain varying from paths, grass tracks and woodland trails to small tarmac sections. With her Tavy 7 run three days earlier in her legs and the Bideford 10 miler looming the following weekend, Jo slightly regretted entering this, especially at the point where she and some other runners took the wrong course in the dark, but the lure of a “glow-in-the-dark” medal was enough to keep her going to complete in 1.02.12. The previous weekend Christine Fritsch travelled up to the Peak District to run a fell race that would give her the qualification she needed to enter the Three Peaks Race next year. Despite her many off-road races, the Three Peaks Race required evidence of completing a longer fell race than most in this area so she entered the Grin and Bear it with a feeling of it just ticking a box. However it turned out to be a lovely race and she thoroughly enjoyed it, despite it being a tough 17 miles, finishing in 3.57.49. Last Thursday saw a big milestone for the club with the first ever ORC Junior Athletics Club training session being held in Okehampton College sports hall. Committee member Rob Hicks raised the idea of a junior section at the 2017 club AGM and with the support of the Running Club and OCRA this idea became a reality and the latest sporting opportunity for children in the area. Rob first had to complete England Athletics training courses to qualify fully as a coach and was pleased with the feedback from parents and children after the first session where 21 young athletes between the ages of 8 and 11 enjoyed an hour of javelin throwing, long jump techniques and relay running. All aspects of athletics will be covered in future sessions and as members of an Affiliated club the children will be able to enter EA competitions if the they wish. Not forgetting the brave Saturday moor runners. Thank you Jane for your continued efforts. 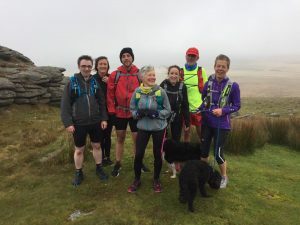 In terms of numbers, the biggest race of the weekend was the Tavy 7 where an impressive turnout of 27 ORCs braved a biting gale force wind that blew straight across the open moorland around Plaster Down, the setting for this very popular race. Despite the wind there was some great running by Okehampton members with a good haul of prizes being won. Janet White claimed the only ladies age group prize with a win in the FV65 category, while Jo Page, Emma Dean and Jackie Dawes made up the second placed Ladies Team. 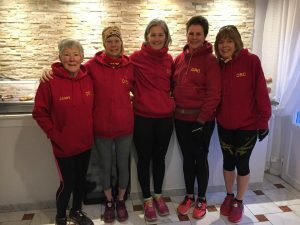 Jo was the first ORC lady home, fourth lady overall and third Senior Lady, setting a new ladies club record for the distance, while Jackie’s time set a new FV50 club record. Andrew Vernon was the first ORC home and took the second MV50 prize for his efforts. Mervyn Rice was third MV60 setting a club MV60 record, while ORCs took two prizes in the MV65 category with Ged Fitzgibbon having a great run to come second and Paul Evison claiming third. Andrew Vernon, Hayden Bond, Mike Baker and John Binns made up the third placed Men’s Team. ORC times; Andrew Vernon; 46.06, Hayden Bond; 46.31, Jo Page; 49.13, Mike Baker; 51.57, John Binns; 52.30, Phil Read; 53.40, Emma Dean; 54.31, Mervyn Rice; 55.09, Jackie Dawes; 56.37, Ged Fitzgibbon; 57.39, Paul Evison; 58.15, Anne Binns; 58.19, Ian Page; 58.29, Tom Andrew; 58.29, Lucy Brint; 1.01.16, Jo Camies; 1.01,17, Cathy Carey; 1.01.18, Jane Jackson; 1.01.19, Chris Fullford Brown; 1.02.23, Lucinda Waslsh; 1.02.39, Tracey Mills; 1.04.45, Sarah Turner; 1.04.53, Katy Speak; 1.05,01, Carole Cornwall; 1.08.08, Rachel Haydon; 1.09.30, Jo Drew; 1.17.19, Janet White; 1.19.00. 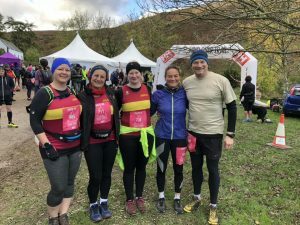 On Saturday Five club members set out to Exmoor to take part in the Exmoor 10k Trail Running Challenge, one of four distance options organised by The Trail Events Company. Set in the beautiful Doone Valley, these races start and finish at Cloud Farm near Malmsmead with distances from 10k to ultra marathon. The 10k route follows a trail beside the lovely Badgeworthy Water through ancient woodland before turning to climb up over open moorland, crossing Lancombe Ford and Malsmead Hill to descend through a steep coombe back to Cloud Farm. 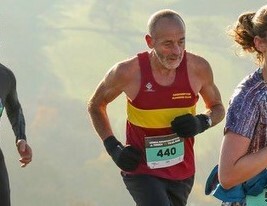 Phil and Gill Spinney ran together, this being Phil’s first race for over a year due to injury, and finished in 1.16.42. The other three ORCs also kept each other company, with Sarah Bell and Jessica Corcoran finishing in 1.38.02 with Claire Sprague close behind in 1.38.19. 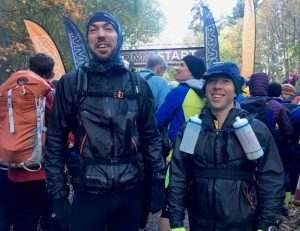 On a more challenging scale, Okehampton’s Rob Hicks, along with his friend Will Hancock took part in this year’s Original Mountain Marathon, or the OMM as it is known. This race changes its location each year and this year’s race was set in the Black Mountains in Wales. It was created in 1968 to test the skills of self reliance, route selection, endurance, teamwork and mountain judgement of those that take part. It is a two day event run in pairs, each team having to carry a tent, cooking equipment and food for 36 hours along with a considerable mandatory kit list. There are a selection of courses to choose from, the Line courses being based on the fastest time around a number of checkpoints, while the Score courses have a fixed period where teams accrue as many points as possible in the time allowed across the two days. At the start of each day they are given a map and have to plan a route visiting the marked checkpoints, finishing at an unsupported wild camp at the end of day 1 and at the event HQ on day 2 . The team visiting the most checkpoints in the fastest time are the winners. Rob and Will chose the Long Score course where some good route choices served them well and in bitterly cold conditions including a couple of hours of snow they did remarkably well, finishing with a top 10 placing among some high class competition. After running two marathons last weekend Roger Voaden was bagging another one in his quest to run 100 marathons, at the Dartmoor Vale Marathon on Sunday. Roger had a good run to finish in 3.19.59, coming 9th overall and second MV50. Many thanks to Jane Jackson for all the reporting. Error: Error validating access token: Session has expired on Saturday, 20-Apr-19 03:20:42 PDT. The current time is Monday, 22-Apr-19 11:25:08 PDT.